MALLET -Nouvelle Guinée et Carpentarie. MALLET,A.M. - Nouvelle Guinée et Carpentarie. Nouvelle Guinée et Carpentarie. - MALLET,A.M. Title : Nouvelle Guinée et Carpentarie.. Size : 6.1 x 4.5 inches. / 15.4 x 11.5 cm. 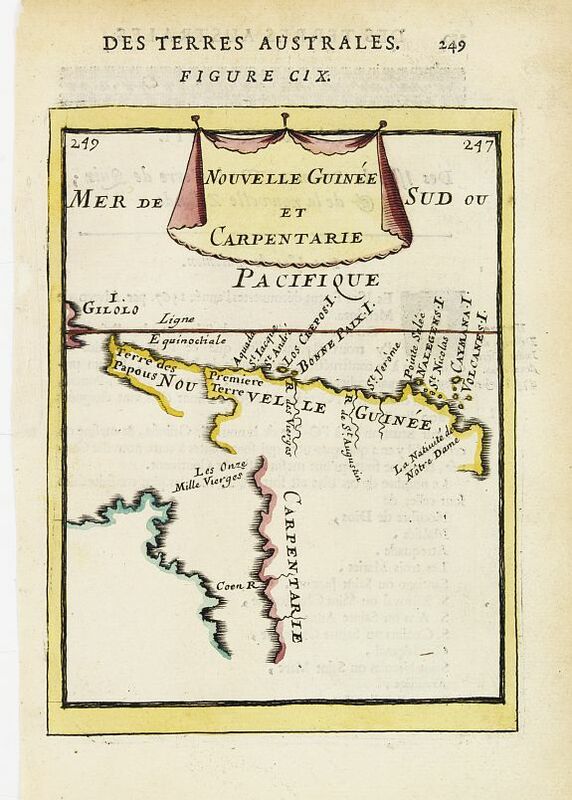 Description :A charming late 17th century French map of the coast of Australia round Carpentaria Bay and New Guinea. Title displayed on a draped cloth above. Condition : Some marginal age toning of the paper. Left margin partially reinforced with paper. Else very good condition.